Flexible food. Think about that. I’m not talking Gumby flexible, which would be unappealing, but who doesn’t love a recipe that can be easily adapted to work for a family of four or for a larger party of 80 guests? And one that can handle ingredient substitutes you love, and still taste great? That’s the great thing about smushies: they can easily be modified to fit any taste and feeding need. When Annette, Eva and I develop recipes, we always consider quantities and preparation time in particular – these are two key elements behind how easily a recipe can be adapted. We also consider flexibility in terms of portions, ingredients and serving styles. Our “Your Choice” Board is a perfect example, and one of the reasons we highly encourage the use of serving boards. 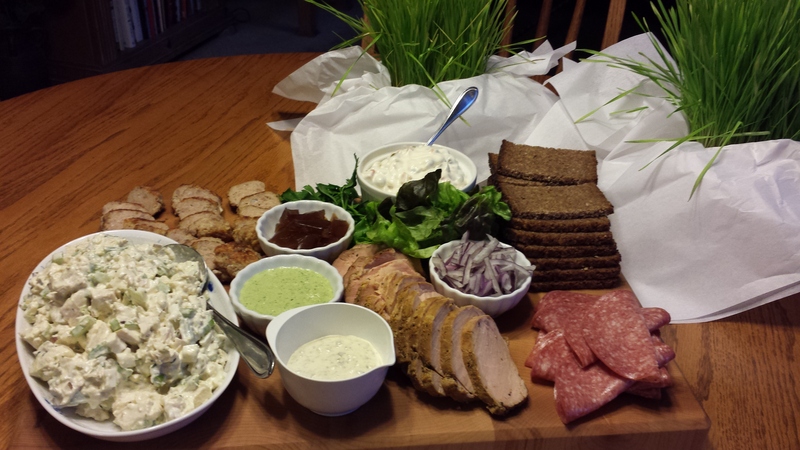 You can craft your own smushies just the way you like them: chicken salad with a little arugula on rye, maybe salami with mayo on some nice fresh French bread, or sliced roast pork with red onions, beets and dill sauce on pumpernickel. We do this with salads as well, serving them on boards, so our guests can choose exactly what they like and as much or as little as they like. We suggest several ingredients that provide a colorful display (and taste great together). 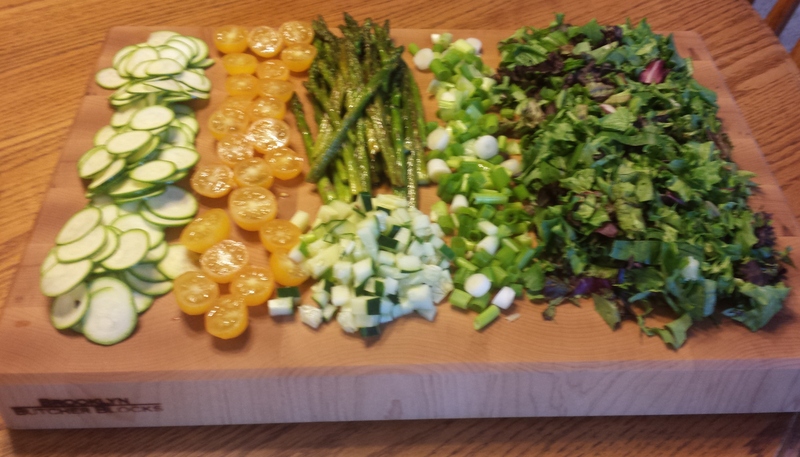 Pictured above are mixed greens, scallions, yellow cherry tomatoes, roasted asparagus, thinly sliced zucchini, and diced cucumber. There are also several additional options, such as cold sliced boiled potatoes, sliced red onion, and shredded carrots, which can be added or substituted. This is a great accompaniment to the “Your Choice” Board. We serve this salad with a Ranch dressing and it’s delicious, a real crowd pleaser. If you feel adventurous, you can add a teaspoon of prepared horseradish to one cup of ranch dressing. We think most people appreciate having lots of great-tasting options, and in fact there are many options for how to make that a reality.